Here I show you how to properly set all of the settings for our WordPress Shopping Cart. 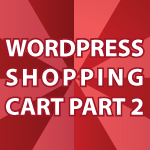 If you missed part 1 check out WordPress Shopping Cart Tutorial. All of the possible settings for the WP E-Commerce Plugin are covered in the tutorial below. It’s awesome and completely useable even in its completely free form. The theme I made for this tutorial is also available for free here Shopping Cart Theme Files. Thanks for awasome tutorials. This site is completely cool. I learn much from you derek, cause i newbie for designing web or blog. Right now iam still learn from your video. I come form Holland.Thanks for your good explanation. I have a lote of inspiration when i looking the tutorials. I am a newbie in WordPress. If you have more time, can you also do a tutorial about the plugin woocommerce with WordPress. Thanks. Hello Jaycop 🙂 When I was deciding on what shopping cart I wanted to use I chose WP E-Commerce because it was less expensive and still did everything I needed it to do. For example I often need to provide for shipping for USPS, UPS and FedEx. With WP E-Commerce I could do that for just $25. With Woocommerce I would have to pay $150. Woocommerce seems to look better, but it was also much harder to edit the themes with it. As you saw in this tutorial, I easily changed the theme for WP E-commerce. When it comes down to it, it is all about personal preference, but these are just 2 reasons why I choose what I did.